When you buy your bottled water for the trip to the Gym or your daily commute, it’ll probably come in a PET bottle. PET stands for Polyethylene Terephthalate, a type of polyester: a material that’s more like fabric than plastic. This material is turned into plastic bottles by means of extruding and molding. “Virgin” PET is an expensive type of resin due to its being an “engineered” resin, and is costlier than most commodity resins. Aside from this, Virgin PET is not very eco-friendly; as it is created from oil, and the processes for creating Virgin PET plastic bottles use up a considerable amount of energy. However, PET bottles are highly recyclable, and their recycled form; called RPET (Recycled PET) is a better, and more eco-friendly packaging alternative than Virgin PET bottles. RPET plastic is very sustainable, as it can be 100% completely recycled: bottle, label, and cap. This means that RPET bottles have a lower carbon footprint than Virgin PET bottles, and it takes less energy to recycle and create an RPET bottle than to manufacture a Virgin PET one. Recycled PET bottles are just as light as Virgin PET bottles, and much lighter than conventional glass bottles of the same size. This means that they help to cut down on fuel costs during transport, conversely lessening C02 emissions to the environment. Another advantage to using RPET plastic bottles is that they are virtually shatterproof, and are a packaging material that is both safe and hygienic to use for food and beverages like water. Additionally, the recycling of PET bottles means that they are not thrown into landfills to cause more pollution, but are a form of post-consumer waste that becomes a useful commodity in manufacturing again: this in turn allows companies to deliver and meet environmental and sustainability goals set by the government. The Water Depot provides personalized bottled water using bottles, labels, and caps that are made from 100% BPA-Free and 100% Recyclable high-quality plastic. We have also begun introducing RPET bottles, which are made from plastic that has been recycled from Virgin PET and is totally eco-friendly. Our bottles of Purified Water and Award-winning Natural Spring Water follow strict EPA standards to ensure their safety. We can also customize your bottled water label with your company’s logo, product, and message for you to be able to promote your business using our water bottles. 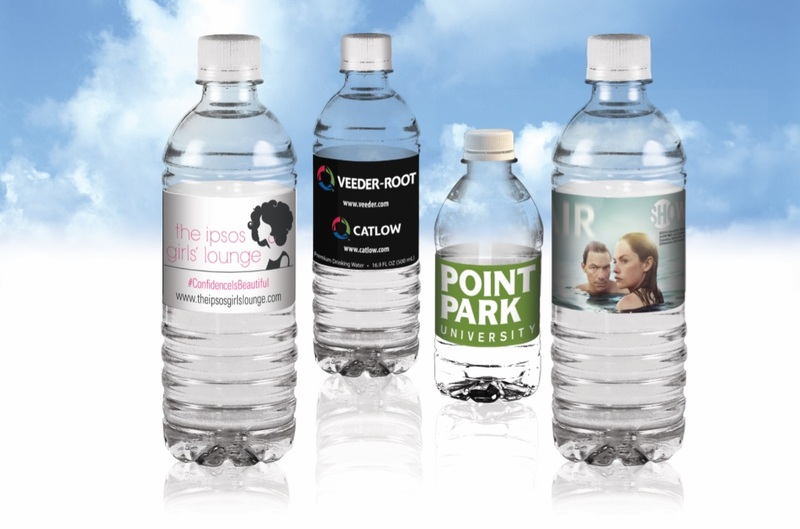 Contact us for your custom label bottled water quote, or call us up toll-free at 1-866-903-2505.